4 bedrooms with 2 master suites (can sleep up to 10) · Peaceful secure gated community · 10 minutes from Disney Parks · Free internet/wifi and cable TV · Free local telephone calls · South facing swimming pool * Child safety fence around * Games Room with pool and darts Our privately owned villa is located on the beautiful gated community of Town Centre Reserve, which is set in a protected conservation zone making the location a peaceful haven, The Reserve is set around lakes, which can be enjoyed to the full during a short stroll with benches strategically positioned. Disney is only 10 minutes drive away. 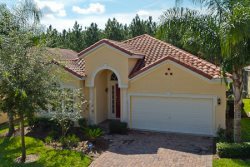 Also set 4 minutes from Interstate-4 and with only one set of traffic lights means that all the attractions that Orlando has to offer and this is not just confined to the theme parks are all in easy reach. Being located to the south of Orlando means you are also in easy reach of the gorgeous white sands and warm waters of the Gulf of Mexico. For those who play golf we are only minutes from Champions Gate, Mystic Dunes and Reunion golf courses, indeed there are many to choose from within a short drive. To comfortably sleep 8 people our villa has 4 bedrooms with 2 master bedrooms with Queen beds and each with en-suite, bedrooms 3 and 4 have twin beds that share a bathroom, importantly there are hairdryers in both master bedrooms, 3 of the bedrooms have TVs. To accommodate up to 10 people there is a queen size sofa bed located in the lounge. The villa benefits from high vaulted ceilings making the living areas feel light and airy and of course there is air conditioning throughout with ceiling fans in all rooms to provide additional comfort. The kitchen, breakfast bar and dining area are well appointed with everything provided to cater for all guests needs. The kitchen is fully fitted with a large fridge freezer, cooker hob and oven and there is also a fitted microwave oven. So that you can freshen your clothes after a day in the sun there is a washing machine, tumble dryer, iron and ironing board available for your use, this of course offers you the opportunity of bringing less luggage and therefore more room to take home those holiday purchases from the fabulous shopping malls only a few minutes drive away. For those evenings that you do not want to go out the villa offers a large HD television connected to cable-TV with a selection of DVDs to play in the DVD player, there is also free wifi internet broadband and a selection of books. For those who enjoy outside cooking a BBQ is available for use just outside the pool screen. For enjoyment and a little competition there is a pool table and dartboard in the garage converted to a games room with a fan, pool table lighting and bar table and stools for added comfort. Facing south within the screened enclosure is the swimming pool which is not overlooked, this can be accessed via sliding screens from both Master bedrooms as well as the lounge, for safety and peace of mind there is a 4 foot child safety fence surrounding the pool which can be easily removed should you so wish. There are of course tables, chairs and loungers so that you can relax after a hot day or stay home, relax and soak up the sun; you can enjoy breakfast by the pool in the cool of the morning. In the evenings there is lighting to the pool and pool area providing a very comfortable area to watch the sun go down. The pool overlooks a lake beyond the conservation area teeming with wild life, you are likely see the tall Sandhill Cranes strut past and some of the many exotic creatures that inhabit the area which include eagles, hawks and cardinals. The villa benefits from true 24 hour management and support which in the event of a problem or mishap are only a phone call away, for your convenience a safe is provided, as is a generous supply of bed linen and towels. For those with small children a high chair and stroller are provided.